Community managers spend their time in numerous community activities related with his/her main role: to get people to talk and contribute, react to the community managed, keep people engaged, etc. Key Performance Indicators (KPIs) should be set for each community based on its goals. It’s part of the job to elaborate reports with multiple metrics on community health for example. But, measuring should be an effective task. The Xen project is an open source software project that does pre-commit peer code review. This means that every change to the source code follows a code review process, in which any developer can participate, before being accepted in the code base. During that process, the patch is carefully inspected and improved thanks to the contributions of the reviewers. The process takes place in the xen-devel mailing list. So you decided to use metrics to track your free, open source software (FOSS) community. Now comes the big question: Which metrics should I be tracking? The post “Top five open source community metrics to track” that I wrote for OpenSource.com deals exactly with answering that question. Based on our experience at Bitergia, the post proposes five families of metrics: activity, size, performance, demographics, and diversity. I’m sure that some important aspects may be missing, but still, this could be your first list of metrics to track, should you be interested in knowing about how your pet project is behaving. Go and read the full post if you are interested in more details. Liberty is the new release of OpenStack. 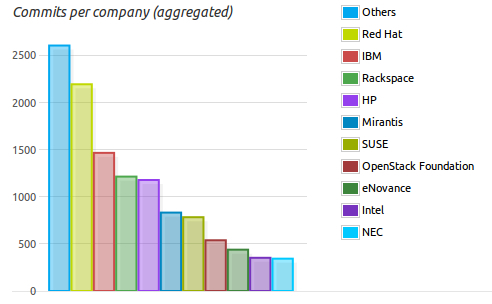 This shows an increase in activity and people participating in the development of OpenStack. Kilo, the new OpenStack release, shows a continuous increase of activity if compared to Juno. From Icehouse to Juno, there was an increase of 6.22% in the number of commits and 17,07% in the number of unique authors. From Juno to Kilo, there’s a higher jump in terms of commits (11,23%) and a lower increase in terms of authors (11,16%). However, with this increase, there is a new peak in the number of unique authors contributing to the OpenStack Foundation projects with close to 1,600 different people participating in its development. GrimoireLib aims at providing a transparency layer between the database and the user. This helps to avoid the direct access to the databases while providing a list of available metrics. This is a Python-based library and expects an already generated database coming from some of the Metrics Grimoire tools. CVSAnalY, MailingListStats, Bicho and most of the tools are already supported by this library.